PIC writer I ever Akizuki (AKI-PIC programmer Ver4) was conducted using a PIC write. The PIC Akizuki was not particularly a problem with the writer, in order to spare to buy a starter kit PICkit2 there. This time with ZIF sockets for easy modification. What is the PIC microcomputer? The PIC (Peripheral Interface Controller) and was developed in order to perform peripheral control IC, the IC is able to write programs. PIC is the CPU and memory to have a processing capability as the software (program) control. However, CPU processing power and memory capacity is not as large. If PIC is not used, various IC is usually combined, and the circuit is made by making good use of an analog circuit. 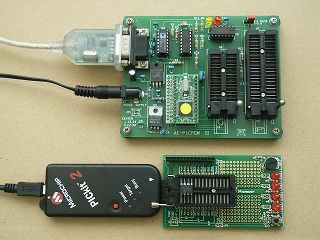 However, because the control part can be composed only of PIC by using PIC, the circuit can be made very compactly. And somehow I was able to use PIC microcontrollers touch, 8 pin PIC I have become addicted. PIC program is running through my thoughts, my own IC can make is great. This is PIC writer whom I am handling. It is the one that the under remodeled the PICkit2 starter kit of Microchip by the one that the USB cereal converter was put up to the PIC writer kit of (AKI-PIC programmer Ver4). At present, both things that the PICkit2 starter kit was remodeled correspond only to a part of 8 pins, 14 pins, and 20 pins though it is possible to write in PIC well. This is PICkit2 starter kit of Microchip. It corresponds only to a part of 8 pins, 14 pins, and 20 pins in this kit, and ZIF (0 Zero Insertion Force socket pressure socket) has not adhered either. The PICkit2 starter kit of Microchip has been remodeled. 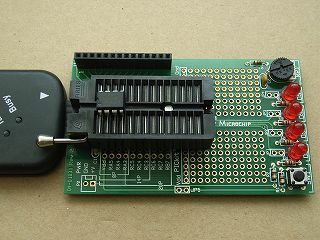 This is putting up of ZIF (0 pressure socket) to the PICkit2 starter kit of Microchip. 0 pressure socket of 28 pins was only inserted in IC socket that the above-mentioned had added. 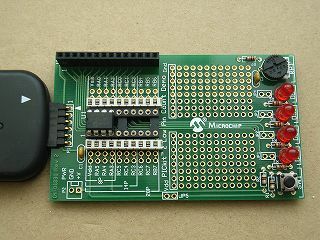 A part of 8 pins, 14 pins, and 20 pins can be written by easily exchanging PIC in this. It is necessaries in a small amount of-mass production. It might be especially unnecessary in a personal experiment. There is not an inconvenience because I am using the one of chiefly eight pin either. A versatile treatment device need not be separately made.